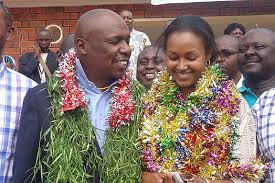 The presence of Baringo senator Gideon Moi’s wife, Zahra, at a political function whose chief guest was Raila Odinga has given credence to reports that the top three powerful families, the Kenyattas, the Mois and the Odingas, have plans afoot to rally behind one presidential candidate in 2022. The media-shy Zahra was present during the commemoration of one year of the Building Bridges Initiative in Nairobi. BBI is an initiative of Uhuru Kenyatta and Raila to purportedly return the country to sound political footing after rivalry threatened to tear the country following the 2017 disputed presidential elections. Gideon, who is a Christian, is married to Zahra, a Muslim and the couple has three children. Zahra has made countable media appearances with the most notable one being when she bagged the prestigious Restaurant Of The Year Award for Lord Errol Hotel which the couple owns. Lord Errol Hotel, which is a facility with a colonial-style building, is located in the leafy Runda Estate, a few minutes’ drive from Unep Headquarters and the American Embassy. It is at the same hotel that weeks back, Gideon had hosted Raila for a political discussion on the way forward. Their meeting came at a time when scores of William Ruto’s are charged in court or summoned by the Directorate of Criminal Investigations to record statements over their involvement in alleged graft. During the women’s meeting, Raila dismissed claims that he was using the March 9 2018 handshake with Uhuru to rock the Jubilee Party. 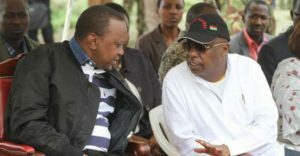 Uhuru with Gideon Moi sometime back. 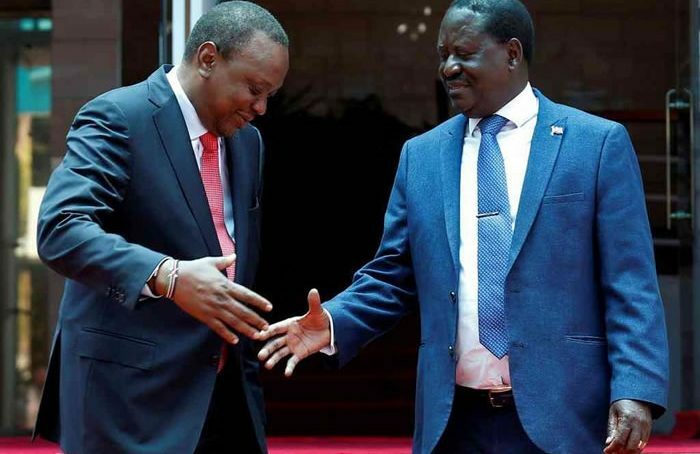 Insiders aver that Uhuru has been pushing for Raila and Gideon to work on a formidable alliance ahead of 2022. In fact as part of the deal, Kalonzo Musyoka, the Wiper leader and Musalia Mudavadi of ANC, are to be accommodated at a later stage as Ruto is isolated. Uhuru is aware that a section of Jubilee are planning a vote of no confidence on him and thus brought Raila and Gideon to marshal their MPs to counter such schemes in parliament now that Jubilee is a crumbling house. That something is in the cooking publically was manifested in the presence of Senator James Orengo at State House when Uhuru assented to three bills last week. Orengo’s presence when Uhuru assented to energy Bill 2017 was quickly read by observers as an early warm up on the kind of a team Uhuru and Raila are building ahead of 2022 general elections which is expected to be marked by fireworks. The State House event was also attended by national assembly speaker Justin Muturi, the senate’s speaker Kenneth Lusaka, majority leader in parliament Aden Duale and his senate counterpart Kipchumba Murkomen, clerks Michael Sialai of national assembly and Jeremiah Nyegenye, senate. Senator Gideon with wife Zahra. The notion to block Ruto from ascending to presidency by use of constitution seems to have been a top option in Uhuru-Raila camp as it became apparently clear when Uhuru confidant, David Murathe went public on the matter. Murathe who was widely viewed by those in Ruto’s camp as Uhuru messenger later relinquished his post as the Jubilee deputy chairman, a way of making it appear that hurting sentiments were his own and Uhuru’s indirect way of communication. Coincidently, the controversial Murathe has roped in Orengo to lead in the war aimed at blocking Ruto from ascending to presidency. Why Uhuru hosted Orengo for hours at State House has not been received well by Ruto’s camp. For now, it is said Raila and Gideon are consulted by Uhuru on the daily running of the government with Ruto put on the periphery. 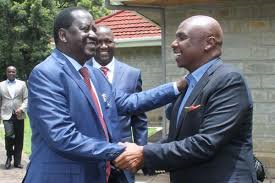 Keen observers will have noticed that as Ruto allies are being sacrificed and removed from plum positions, they are replaced by those of Raila or Gideon. When Rashid Echesa was dropped from the cabinet, a Luo, George Magoha replaced him. Magoha like Raila comes from Siaya county. Siaya county has produced all Luo cabinet secretaries, Magoha, Racheal Omamo of Defence and Raphael Tuju cabinet secretary without portfolio. Many had expected Uhuru to involve the deputy president in the recent appointment of Inspector General of Police since he is the person to oversee the 2022 general elections. A Kamba, Hilary Mutyambai was nominated for the slot. Gideon’s allies have also landed posts in parastatal boards.